I wrote about Vinnie last year in my very first Illustration Concentration post. 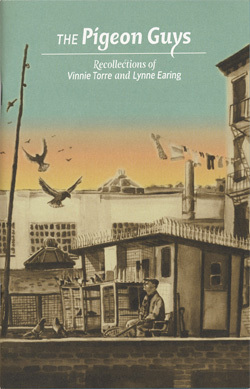 I met Vinnie and his girlfriend Lynne Earring when I illustrated a chapbook for the Hoboken Historical Museum. 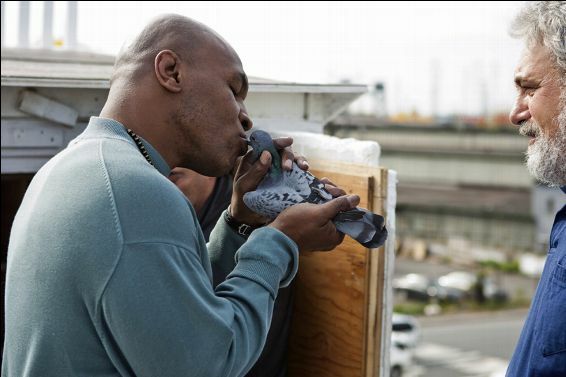 Turns out Vinnie has recently been featured on a new Animal Planet documentary series mentoring boxer Mike Tyson on the finer points of pigeon racing. I haven’t seen the series. In the trailer, Mike Tyson tells about the first fight he ever had. He was 10. He beat up the Brooklyn kid who ripped the head off his pigeon. 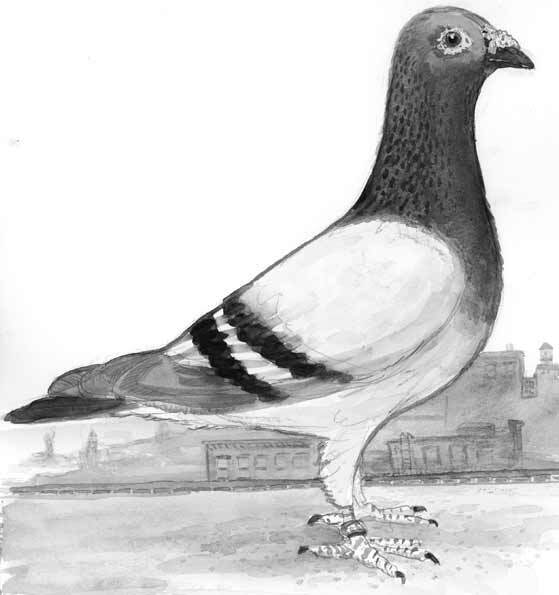 In honor of the uptick in searches for Vinnie and pigeons, I am posting a few more of my Hoboken sketches, some of which never made it into the chapbook. Lynne told me that Vinnie used to cut down the iconic Hoboken clotheslines that hung in the way of his pigeons’ final approach home. Vinnie looked wounded, he said he never did any such thing. Maybe, once or twice, he witnessed somebody sanding clotheslines so that they were so frayed that when the women hung their family’s heavy, wet clothes they “naturally” broke. He assured me that would happen only in the case of a very important race. 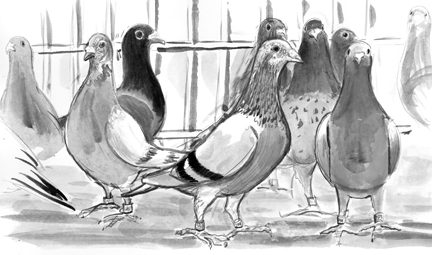 You can download the whole book for free here: The Pigeon Guys: Recollections of Vinnie Torre and Lynne Earing. 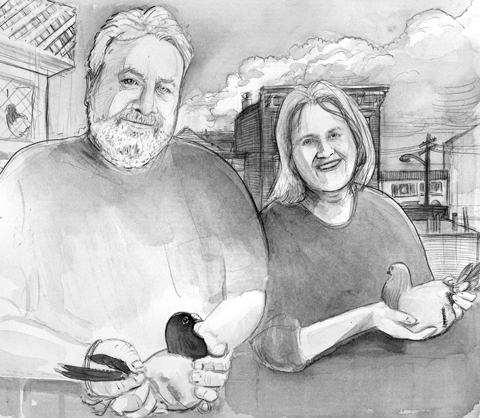 The 40-page chapbook, designed by Ann Marie Manca is part of a nifty series of Hoboken oral histories. Lisa Sartori interviewed Vinnie and Lynne. Holly Metz edited it, I donated the illustrations, and Museum Director Robert Foster added historic and new photographs. By the way, I was in Hoboken last weekend and stopped by the Hoboken Historical Museum. 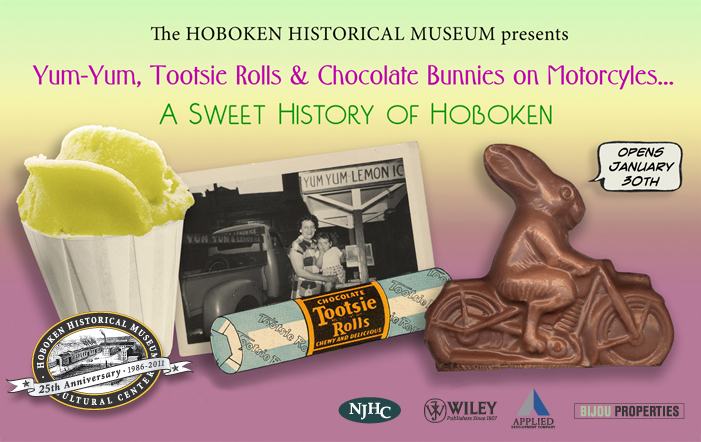 They have a sweet show on the walls now, about Hoboken’s love affair with candy and desserts. It began way before the Cake Boss. At the museum you can sit in a booth on loan from Schnackenberg’s Luncheonette and watch a truly touching 10-minute film about Schnackenberg’s, a Hoboken landmark. The film entitled Counterparts was made in 1989 by Nicole Lucas Haimes who has since gone on to a successful career as a documentary filmmaker. Vinnie Torre is a great booster of the Hoboken Historical Museum. In the Animal Planet videos he can be seen wearing his HHM T-shirt. It is a worthy institution and well worth a visit anytime.